Powers/Abilities: Doctor Eclipse has similar reality manipulating powers to those of Solar. History: Special investigator Fred Bender once coveted the limitless power wielded by Solar, Man of the Atom. However, such godhood was denied him and he was stranded by Solar in the middle of the desert. 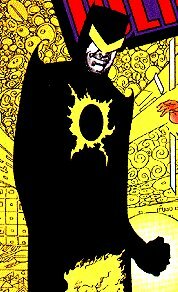 But Master Darque had other plans for Fred Bender, and converted him into Solar's counterpart - a being of vast necromantic energy to serve as Darque's most powerful instrument of destruction. Where Solar's power had thrilled Bender with the wonder of Creation, Darque's gift of power numbed him with the emptiness of Death. Reborn as Doctor Eclipse, Bender was now cursed with the power he thirsted for, his black vestments reflecting the dark madness in his soul.